the time players take for their moves in a board game. Download GameTimer on the AppStore! Do you have more questions or some feedback? Please send me an email. Starting the game is as simple as tapping the 'Start' button. You can see who is on the move using the green highlight. The next player is shown with a more subtle yellow glow. When a player has finished his move, you can either tap the current player's button &dash; or you can use the 'Next' button. This stops the current player's clock, puts the next player on the move and starts the next player's clock. 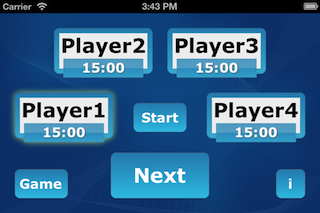 Moving to the next player can be done by designating one of the players as the time keeper, or each player can tap his button at the end of his move. When the game is running, you can always stop the game by tapping 'Pause'. To re-start, just tap the 'Start' button again. Setting up a new game is easy. Tap the 'Game' button to open the 'Game Configuration' view. If you just want to use the current configuration, all you have to do is tap the 'Start New Game' button. If you want to, you can change the game's parameters first. When you want to start a new game, you can set up the timing scheme for your game. Just decide whether you just want to measure the time players take for their moves or whether to use a countdown scheme. You can also set the time for each player. 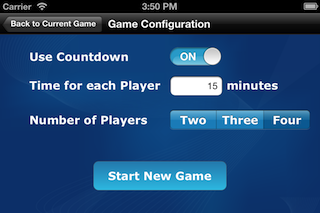 GameTimer can be used for two to four players, allowing time control for all popular board games. Just tap the button corresponding to the number of players in your game. It's easy to spot when a player has used up all his allotted time: The time will be displayed in red. Development for GameTimer continues, I've got a number of ideas for improvements. Please leave your email address below, and I will keep you posted on my progress and important milestones.